BUENOS AIRES, Jun 8 2018 (IPS) - As in other Latin American countries, in recent years China has been a strong investor in Argentina. The environmental impact and economic benefits of this phenomenon, however, are a subject of discussion among local stakeholders. One of the key areas is energy. A study by the non-governmental Environment and Natural Resources Foundation (FARN) states that China has mainly been financing hydroelectric, nuclear and hydrocarbon projects. Just four percent of these investments are in renewable energies, which is precisely the sector where the country is clearly lagging. “China’s main objective is to export its technology and inputs. And it has highly developed hydraulic, nuclear and oil sectors. There are no more rivers in China where dams can be built and this is why they are so interested in the dams on the Santa Cruz River,” María Marta Di Paola, FARN’s director of research, told IPS. China is behind a controversial project to build two giant dams in Patagonia, on the Santa Cruz River, which was approved during the administration of Cristina Kirchner (2007-2015) and ratified by President Mauricio Macri, despite strong environmental concerns. The dams would cost some five billion dollars, with a foreseen a capacity of 1,310 MW. “Like any country with a lot of capital, China is interested in all possible businesses and takes what it is offered. In fact, in Argentina it also has a high level of participation in the RenovAr Plan,” explained Girado, an economist and director of a postgraduate course on contemporary China at the public National University of Lanús, based in Buenos Aires. He was referring to the initiative launched by the Argentine government to develop renewable energies and revert the current scenario, in which fossil fuels account for 87 percent of the country’s primary energy mix. Also participating in this industry are Chinese companies, which during the period January-September 2017 produced 25 percent of the total oil and 14 percent of the natural gas extracted in the country. The goal is to comply with the law enacted in 2015, which establishes that by 2025 renewables must contribute at least 20 percent of the capacity of the electric grid, which today is around 30,000 MW. In this sense, 15 percent of the power allocated through the RenovAr Plan has been to Chinese capital. One mega project in renewable energies is the Caucharí solar park, in the northern province of Jujuy, which is to consist of the installation of 1,200,000 solar panels built in China, on a 700-hectare site. The project has a budget of 390 million dollars, of which 330 million will be financed by the state-owned Export-Import Bank of China. China is also behind Argentina’s intention to develop nuclear energy, since in 2017 it was agreed that it would finance the fourth and fifth nuclear power plants in this South American country, at a total cost of 14 billion dollars. The decision is aimed at facilitating the granting of a loan from the International Monetary Fund (IMF), after the crisis of confidence that resulted in a massive outflow of capital and which put the local economy in serious trouble. So far, the investments already committed by Beijing in the energy sector in Latin America’s third-largest economy total 30 billion dollars, in addition to projects in other areas, such as infrastructure, agribusiness or mining. The veteran diplomat recalled a point made by then U.S. President George W. Bush at the 2005 Summit of the Americas (SOA) in the Argentine city of Mar del Plata, where the region refused to form the Free Trade Area of the Americas (FTAA). “He (Bush) told us,’I don’t know why they care so much about the FTAA, when what we need to discuss is how we defend ourselves against China’,” Taiana said. “Argentina, for example, built its railways with English capital, and all the tracks converge in Buenos Aires because the English were only interested in getting the agricultural products to to the port. Those are the things that shouldn’t happen,” he added. 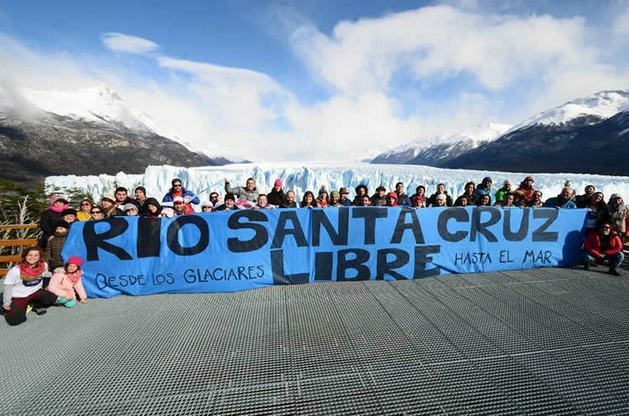 Environmental organisations are particularly critical of the dams on the Santa Cruz River, which begins in the magnificent Los Glaciares National Park and could affect the water level in Lake Argentino, home to the Perito Moreno Glacier, one of the country’s major tourist attractions. However, the dam contract has a cross default clause whereby, if not built, Chinese banks could also cut off financing for railway infrastructure projects they are carrying out in Argentina. “What we attributed in the past to U.S. pressure we are now experiencing with China,” said Hernán Casañas, director of Aves Argentinas, the country’s oldest environmental organisation. “The problem is that it does not have the same framework of safeguards, so they are able to start infrastructure works without complying with environmental requirements,” he said.